Thursday, Oct. 3rd Edinburgh Corstophine Rd. Robin Foster got this C. Bustard upright #5032 free on Gumtree. From the looks it’s about 1915. Last tuned 9 years ago by a lily-livered tuner who neglected to bring it up from a full tone low; my cup of tea precisely. 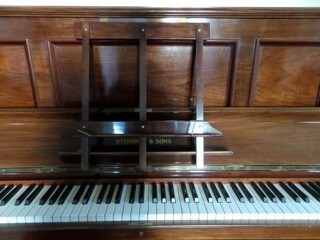 I started at about 10:00, by about noon the piano was up to 441 and totally playable. I used the Steve Franklin (Oakland Calif. +1.510.536-TUNE) method: wrench the temperament up to about 447hz, tune down to the bass – when you get to the wound strings tune very sharp. 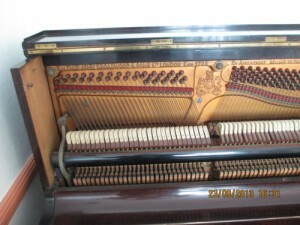 Tune to the E an octave above the temperament, sharping the octaves more and more ’til they beat several times per second, then STOP and start again from the top note (A in the case of this 85-note piano), tuning it by playing the last tuned A above the temperament with the damper pedal on then tuning the highest A very sharp. Work your way all the way back down to the E above the temperament. Go less sharp as you approach the tenor. I call it backwards tuning. Far more stable than the traditional technique. I miscalculated the bass, which sunk to unplayability, so retuned that in five minutes. The treble also sank to 1/4 tone or more flat, so I spent half an hour tuning again above the temperament section. Amazing success. A very good upright up to concert pitch from a tone low for £55 plus tip. 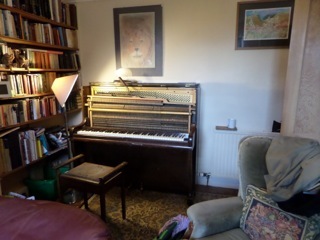 Robin will publicise my offer of free tunings in the Highland and Islands (as long as I can sleep under the piano) because he hails from there. 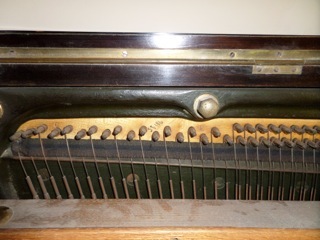 plan: retune within 3 months – or earlier if piano party planned, at which time I will fix the two broken two jacks and one jack spring in the treble. I’ll also try to address a dozen dead bass string singles (see my post re: fixing bass strings). This entry was posted in Blog on October 4, 2013 by tunerben. Grand pianos sometimes need caster cups under the wheels. They’re easy to install (and cheap to buy e.g. £3 from Ali’s Cave in Tollcross near me in Edinburgh). Here’s how. A medium strong person crouches down doggie-style under a corner of the piano near the leg. Her back is up against the bottom of the piano. She straightens her arms and legs until the piano goes up high enough for another person to slip in the caster cup. This won’t hurt her back and impresses the audience especially in the case of a 900 lb. concert grand. If it does hurt anyone please have her people contact my people for an equitable settlement. Saturday, September 7th 2013 Hackney, London. 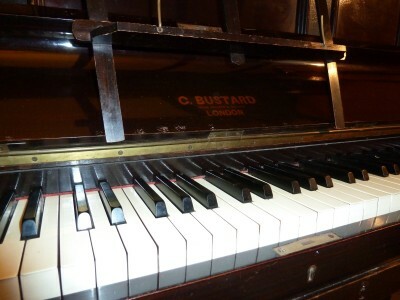 Another excellent English piano – those that make it to the USA are wrecks brought over in containers in the 60s and 70s and sold by piano vultures to naive mothers on the strength of the candelabra, the fine wood and the fancy English nameboards while inside they are neglected, with dried up glue joints, bad tuning pin blocks and trashed actions. I have never shied away from English pianos, but my first 20 tunings on UK pianos here have been amazing to me in that they’ve all been good pianos. 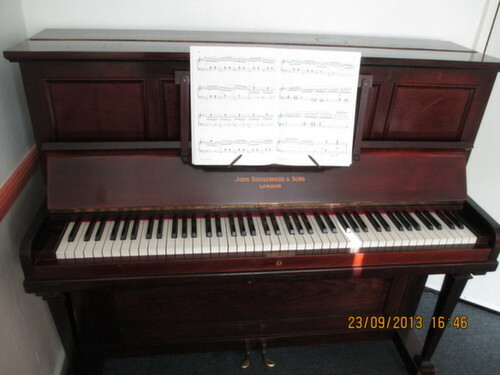 This Broadwood is an excellent example of a 100-year-old upright just sitting in the damp British climate, with no special care, not being played all that much, still in perfect playing condition. It came right up to concert pitch after not having had a solid tuning in years. Pat was too shy to try it out but I think it came out lovely. Why midnight? The last midnight tuning I recall was for Van Cliburn in 1971 at RCA studios in NY. He started at 10 p.m. and worked til dawn playing take after take, having neglected to properly prepare the Debussy. And before that, tuning a harpsichord for Frank Zappa’s all-night Apostolic Productions. No, midnight is past my bedtime now. But I was stoked after The Mitford Society‘s bash, a celebration of my mother and her sisters held in a National Trust house in Hackney. Pat was there with a friend, up from Cambridge, on the panel of a seminar that was part of the evening. They took pity on me, down from Edinburgh, and brought me home to sleep under the piano. The other attendees were Bright Young Things many in 1920s garb roaming from room to transformed room (done up in Mitford themes e.g. the Unity and Jessica Drawing Room complete with Nazi v communist propaganda, and the U and Non U-tube Video room), drinks in hand, saying funny English things to each other. A cheer went up after the movie/flapper event when I was introduced, son of the hands-down favourite Mitford sister. While I was in London, first time in almost 20 years, I stopped by Steinway & Sons to take a tuning test on the chance they might recommend me in Edinburgh for occasions when their man Norman Motion can’t make it. I was introduced to Ulrich, the UK’s premier concert tuner, at Wigmore Hall afterwards. This entry was posted in Blog on September 26, 2013 by tunerben. A good but very sour big German parlour grand – Rönisch #39662 (1905) – tuned from 438 to concert pitch, and addressed damping problems. 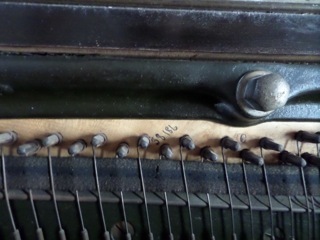 An Edinburgh shop restrung it leaving jumpy but tuneable tuning pins, a false treble (the bridge isn’t perfect so each string emits a faint beat wreaking havoc with fine tuning up there) and poor damper timing (each damper is supposed to lift about half-way up the hammer stroke, and the pedal is supposed to lift the dampers simultaneously). I retimed some and gave one a haircut where it had been damaged. Later Christina should have all the dampers regulated. In New York we hire moonlighters from the Steinway assembly line, the best of whom is Artur Ivanov http://avpiano.com. In Edinburgh I’d recommend trying Steinway’s Norman Motion and his co-worker Alistair Edmondson. The pedal lyre is also falling apart so we found some useless German books to prop it up. I left a note on the top: “Do Not Move Even One Inch before calling Ben Treuhaft.” First you have to remove the books, otherwise the lyre will crack off. Dampers are tricky. Also one of the action stops deep in the keybed was unglued causing a huge rattle. I glued it back in. The action stops a few millimetres too far out causing the top few notes to be dead because they miss their correct striking point. To be addressed in future. This entry was posted in Blog on September 24, 2013 by tunerben. There is no way to get to Craigleith Hill Rd., according to its neighbours. But I am glad I persisted through Craigleith Hill Mews,Craigleith Hill Avenue,Craigleith Hill Street.,Craigleith Hill Close andCraigleith Hill Path; those McCleods are worth the odyssey. 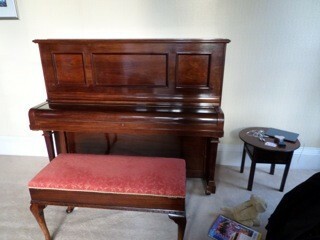 And their piano. 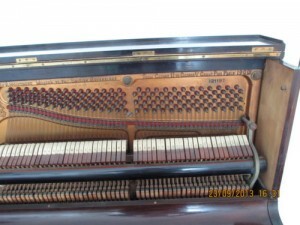 Another English-with-a-German name or German birdcage upright in immaculate original condition from the early 20th century. Another wonderful Scot, Helen looks kind of like me – shoeless, wild bandana and all. But she’s not so much a hippie as a lovely retired schoolteacher who recently beat back cancer via chemo. The Holbein was bought new by a relative, eons ago in Paisley. 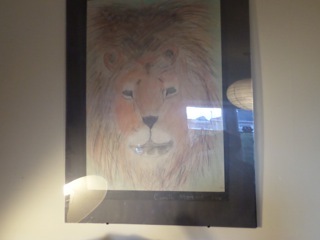 Now it sits in Edinburgh beneath the 5th-grade masterpiece by her daughter, now in her 20s, of a lion with soulful eyes (the girl became a dentist). 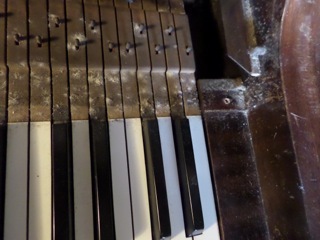 The keyboard wood behind the ivories is covered in mould because of a moisture rod the dealer Allan Makin sold her, not sure why, while he was there tuning a decade ago. That mould is something. And a wee creature or two has moved into the action. When we relocated from NYC almost a year ago, I thought I’d hate tuning in the UK. I thought it would be like England was for me in the 80s: ill-tempered Lady Shmuckface letting me in through the servants’ entrance to tune her horrible wrecked piano for the price of tube fare and a pot of tea. Scotland’s the opposite. Now I can’t live elsewhere. From the pictures….There was never to my knowledge an manufacturer named Holbein; I would assume it was a name used for marketing purposes. I would assume from the style of the serial number that the manufacturer would be Kemble. 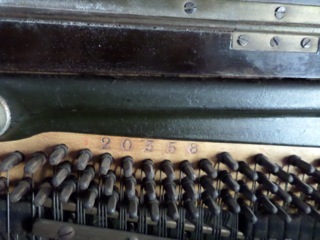 I would place the piano’s year of manufacture to be some time during the 1930’s. Possibly the late 1930’s…..just about the time of the 2nd world war. The cabinet would also lean towards that thinking. This entry was posted in Blog on July 3, 2013 by tunerben. This old Geo. 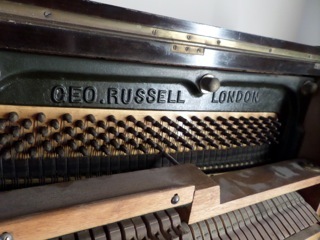 Russell of London is a standard, free off Gumtree (Scottish Craigslist) 100-year-old cottage upright, another perfectly preserved example of early 20th century European piano making. 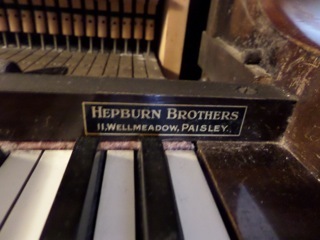 The miserable Scottish dank mist keeps old pianos alive forever. It’s straight strung, losing out on the extra bass tone gained by proper American-style cross-stringing, and with overdampers – a horrible invention popular in Europe through the 1920s even though the Americans had nailed proper underdampers 60 years prior. Overdampers don’t really work, and create an unnecessary tangle of “birdcage” wires making the strings and hammers unaccessible to the tuner. But I don’t complain any more. Although you can’t see anything under the birdcage wires, with my Papps mute – designed for blind tuners – I can tune almost as quick. If it weren’t for chatty, tea-providing customers, I’d be out of the house in an hour or so. This one was only half a tone low. This entry was posted in Blog on June 9, 2013 by tunerben. 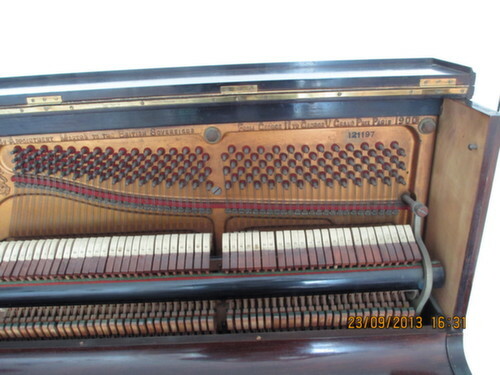 In America a great-sounding 1920s Hamburg Steinway K in such immaculate original condition would fetch $10,000. But let’s leave it here in Bonnie Scotland where it will survive another several generations unlike in the horrible changeable humidity of New York where it would need a new pin block within years. 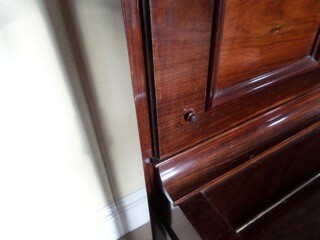 Hamburg Steinway uprights look quite different than American ones, more elegant too. This entry was posted in Blog on May 9, 2013 by tunerben.